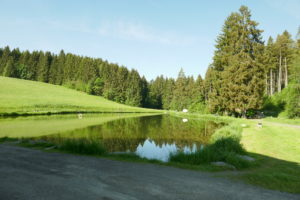 Still-water or small lake fishing is a part of Fly-Fishing Bavaria that can be an art unto itself. It is very frustrating fishing a small lake watching others take fish after fish. This changes once you become familiar with the various techniques available to you. Here in Bavaria, the Fly-Fisherman is the odd man out on most still-waters. This is irrespective of whether they are natural or ‘put and take’ lakes. If you are a novice fly-fisherman, try a ‘put and take’ lake that stocked with rainbow trout. You will catch your fish as long as you persevere. Once you become proficient and find the right technique, you will be able to hold your own. In Bavaria they use spinners, as well as worms, normal maggots and giant Bee Maggots (the larva of the Bee Moth). 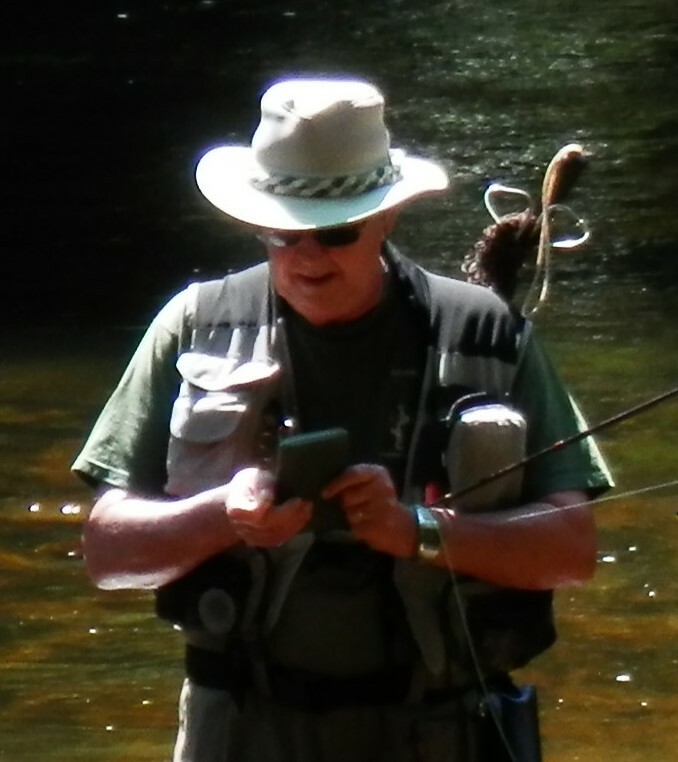 But I still believe that the fly-fisherman has the edge! 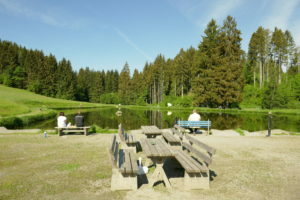 This ‘Angelteich’ or small stocked lake containing Rainbow Trout, Brown Trout. Brook Trout and Arctic Char. The location is at Eppenschlag, near Grafenau, full address below. Fishing starts at 07:00 hours and a half day card allows you to fish until 12:30 hours or 12:30 until 18:00 hours, at a cost of €15. A half day card allows a catch limit of 5 fish. A full day and 10 fish limit costs €25. On my first visit to the lake. I enquired if fly-fishing was permitted. Not all lakes in Germany allow fly-fishing! The owner confirmed that she had no objection. She also stated that she had never had any fly-fishermen on the lake. She doubted if artificial fly would catch fish there. Oh, ye of little faith! On my last visit to stock up on trout for the smoker, I arrived at 07:00 hours. There was light rain and I landed my first fish ten minutes later. Within an hour, the lake was full of fisherman, but I was the only one using a fly-rod. One of the fishermen saw that I was being successful, so he put down his course rod and got out his fly-fishing gear. He made cast after cast for about thirty minutes before putting the fly-rod away. He had not decided what type of fishing he wanted to do and catching fish was his only priority. For me, how you catch the fish is very important, I never eat trout that I have not caught myself, and then only on a fly. Before 10:00 hours I had caught my limit of five fish. These comprised of four good rainbows; and one arctic char. I had also lost two fish which of course, were very large indeed! A young lady fishing nearby, informed me that her daughter had told her not to come home without fish. Despite fishing for many hours she had not been successful. Having reached my limit and not wanting to leave straight away, I decided to watch her technique. Having asked if I could help her, she readily agreed so I watched her float and told her when she had bites. She was not seeing the subtle indications at all because her float was far too heavy. My advice was to change to a lighter float but she did not have one with her. I suggested that she take off the float completely, and then instructed her to take up the slack in the line and hold it in her hand. She now had direct contact should a fish take her maggot. she missed a few bites but within five minutes had caught her first fish. I told her she was almost czech nymphing, one of the techniques we use in fly-fishing. Having cleaned my fish, I was back at my fishing hut in Eging am See by 10:30 hours. This was one of those successful fly-fishing trips that you remember. I had caught my limit, helped a novice and outpaced the course fishermen with their giant maggots. It’s not always like that. The previous trip the course fisherman were hauling them out whilst I had a blank. That is until I had a look at the giant maggots they were using. Changing to a fly of the same color worked a treat.